Morgan Shamy: Are Writers Social? Ever have someone knock on your door, only to invite themselves in and stay for a couple of hours chatting? All the while you keep glancing at your computer, legs bouncing, grinding your teeth, wondering when on earth your friend is going to leave? You find yourself nodding, saying the “Oos” and “Aahs” in the right moments, keeping your face animated, but are dying to just dive back into your story? And then when the door slams you rush to your computer and curse that you’ve wasted so much time? 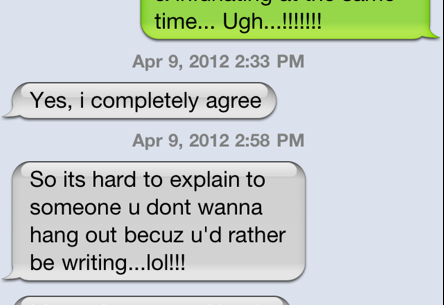 How many of you have a hard time socializing because you’d rather be writing? In the mom/parent world, there’s this thing called cliques. Yes, they exist. I’ve never cared to be a part of them. I don’t know, I’ve never been a person that needs social interaction. I enjoy people, take pleasure from meeting other crazy breeds of people like myself, but I don’t seek it, don’t need it to thrive. Most moms have play dates, park dates, stroller walks, IDK what else… Zumba? (Which is great, it’s just not for me) I’d rather be writing. Time is precious. And after giving as much as I can to the kids, my hubby, the house (okay, I’m kidding, writing totally comes before the house), I want to spend my time creating. Where’s the balance with you? Do you thrive on the social? Or are your characters enough company for you? I like to get out every once in a while, but for the most part I'm a home body. I don't need to get out there and have a ton of friends, maybe because the ones I do make end up being in my life long term. Obviously as a mom it's hard to get out, but now with my oldest in school, I'm meeting more people. So, yeah. I get this kinda often actually. Because when i do hang out with people, which is fairly often, I talk a lot. I'm social. Probably a lot like you Morgan. So they just assume that I should ALWAYS want that. I normally brave the real world when I come to a writer's block. I jump into society head first because I want someone I know to do something that will spark an idea. So I do go and see all those people who pick on me for being a "nerd" but I deal with it because I am using them :) I hope none of them read this! You've been peeking! I have to keep reminding myself that my real life and real people are more important than my imaginary world with it's fascinating characters. 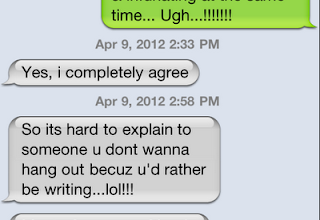 Now if I could just change things in real life like I can in my ms.
Yeah, I'm a bitof an introvert. Sure, I'd much rather write than hang out with many of the people I know. Nothing personal. Its just writing is more stimulating than a lot of people. Hahahaha! You just described my afternoon...and most afternoons, actually. Yes, I have counted down the minutes for visitors to leave, family to stop talking to me on the phone, my husband to finish telling me about his work day, and my children to go to bed, all so I can write. It's what gets me through the day. I'm so glad I'm not alone! *snort* I think I wrote this in an editing induced coma and then hacked your Blogger account to post it, Morgan. It's so sad that we live so far from each other. We could totally hang out, and take pleasure in ignoring the other person in comfort, while we lost ourselves to our own fictitious worlds. LOL! Story of my life. I'd rather be social with the people in my head then the people in the real world. I'm like you, I don't need tons of social interaction to feel normal. The best social interaction I get right now (aside from hanging with my hubby who's my best friend) is on Twitter and the blogs and that's fine by me. I find that my biggest problem right now is not knowing (in real life) people with the same interests as me. I don't have friends who read YA, or write, or really have anything in common with me. All the people I know (in real life) who have kids only seem to want to talk about their kids. That's great, but my hubby and I don't have kids yet. Quite frankly, I'd rather spend my team reading or writing than hanging out with people that I have nothing really in common with. I guess maybe that makes me a bit of a hermit or a loner, but I'll take that any day over feeling obligated to maintain relationships that don't ultimately mean all that much to me. I think that sounds selfish, but c'est la vie, right? I actually wish I could say this was true of me. I spend far too LITTLE time on my writing. I don't fit into any cliques, so I rarely have people just drop by, but if they do, or a phone call comes, I generally take it fine, because I'm not writing anyway :-( but I SHOULD be! Gah! I started a local mommy group when my son was 1 year old. I hadn't realized that I could be like my fave authors and actually *gasp* write the stories in my head. BUT that all changed 1.5 years ago when I finally did make the realization. Now my poor mommy group is neglected so I can write. I actually had a playdate at my house for the first time in months and *guilty wince* I couldn't wait for it to end so I could work on my WIP. Balance is hard, but I do manage it...barely. *grin* Great post, darling lady! I love visiting your blog as usual. BAHAHAHA! Oh this kills me! You are too funny. I am exactly the type of person you wrote about....I thrive on having some outing planned every day and I love meeting new moms and making more and more friends. I've never been as happy! Haha! Wow we are completely alike yet so different. Maybe I would be the same as you if I had an enormous house, four kids, and so much talent that it would be a waste to go anywhere ;) I think you are doing just fine!!! This is so true. It's probably gotten worse for me over the last year maybe. Since I started writing (just over 2 years ago), 3 of my best friends moved away and it opened up so much more time. Of course I wish they all lived here still, but I probably wouldn't have gotten as much writing done. I am the same way too! Would love to just sit somewhere comfy and write. I think this is why I had the hardest time accepting myself as a writer for so long. I saw all of the media messages about how I was supposed to be this other person since I am a mom. I am supposed to be social and have mommy social circles. I have been lucky enough to find a Motley Crew so to speak, that invites me to pop in only when EVERYONE can get together at once. They don't expect me to do all the little stuff they do and they don't judge me for having my own life. Even though that life is in a computer. But like a few other posters here, I do have to get out into the world when I get stuck. In fact, I thought I would write more on the weekends when my kids are gone, but it is actually the opposite. Those are the weekends when I recharge my writer brain and get out into the world to see what is going on. The other 24 days out of the month, I am happy at home...writing. Hey! I commented on this, but I can't find it. I swear I did though. And it was brilliant! So clever! I need a balance of socialising and working, because I find that if I don't socialise for a while, I start to feel a bit isolated from the world, and it affects my writing. Sadly, most of my friends don't live nearby anymore, but just a quick trip into town means that I can talk to a stranger while I'm queuing for my teabags at the supermarket! ;) That always helps! I get anti-social when I have a deadline drawing near. Otherwise I try to see social calls as welcome interruptions. All of my old friends now live many miles away (one is in New Zealand), so this isn't really an issue for me. I do wish I still saw them, but we just converse sporadically on Facebook. The only things that interrupt my writing time are phone calls from double glazing salesmen. I do the school run, but I'm hardly going to be accepted into any mum cliques and I don't want to be. All in all, I'm pretty happy to spend my quality time with my imaginary friends, erm, I mean characters! yes! i love to talk but i have to get my chores done before i walk my dog and run into neighbors, i have to find a block of time to call my mom to give her undivided attention and my long distance friends? we are never in sync =( i miss hanging out with them! I kinda dropped off the face of the planet when I had my baby, so my friends stopped calling for a while. I still haven't "re-instated" (for lack of a better word) them, so I've had all the time I want to do MY stuff. It's kinda nice, I won't lie. A lot of people would miss their friends and that social contact, but I'm kinda loving the ... freedom? Is that too harsh of a word? LOL. I've never had this problem, but I probably don't have as many friends as you. To restate that, I probably only have 1% of the friends that you do. So when my one or two friends come calling, I drop everything and happily go and hang out all day if they want to. I get to see them so infrequently. But I can see that if you have twenty friends all calling and wanting your time. I just simply don't have that fulfilling of a life. I usually have to call people, ask them if they want to do something, plan it ahead of time so that they don't snub someone popular and therefore jeopardize their standing with said person, and then offer to pay to sweeten the deal. Balance, that's the word of the day I think :) I have those moments where I want to be with my family watching a movie or playing outside, but I choose to stay in and write. Then I have those moments where I have to go out with a couple friends or to some function and wish I was home writing. It's a good thing we want to be in front of our imaginary worlds right? I've totally been in that situation! While I need to be social sometimes mostly my family and characters do it for me. And all the wonderful blogging friends I've made. It's not bad if all your friends are virtual is it? LOL. We need to make a therapy class for writers! LOL. This is so funny! At least I have you Morgan! I bring my laptop with me everywhere and I get teased at my in-laws since I've turned down going paint balling because I want to be writing. What better time to do it then when everyone is out of the house and it's nice and quiet? I love my writing time, but I do like to hang out with my friends too. There are times however that I think, I would so rather be writing right now. I have an awesome friend that when she comes over to sew, or play on the computer (shop) or whatever, if I tell her I"m writing, it's no biggie. We sit near one another - she'll sew, or web surf, or whatever, and I'll type away. It's very happy. And yeah. I find myself shying away from any situation where I'll be away from writing too long. Crazy maybe. But true. Also, when people call just after I've gotten kids to bed. That makes me want to scream. I understand completely. I find that I am a homebody, but since I've been writing, I've turned into a hermit. When I'm working on a project, I could care less about what's going on outside the door. And sometimes, like tonight, I have to force myself to go do something social. I sometimes won't even answer my phone, texts, tweets.... When I'm in my zone, I'm there and no one better interfere. Ugh! I sound horrible. But hey, when writers have time to write, we write!